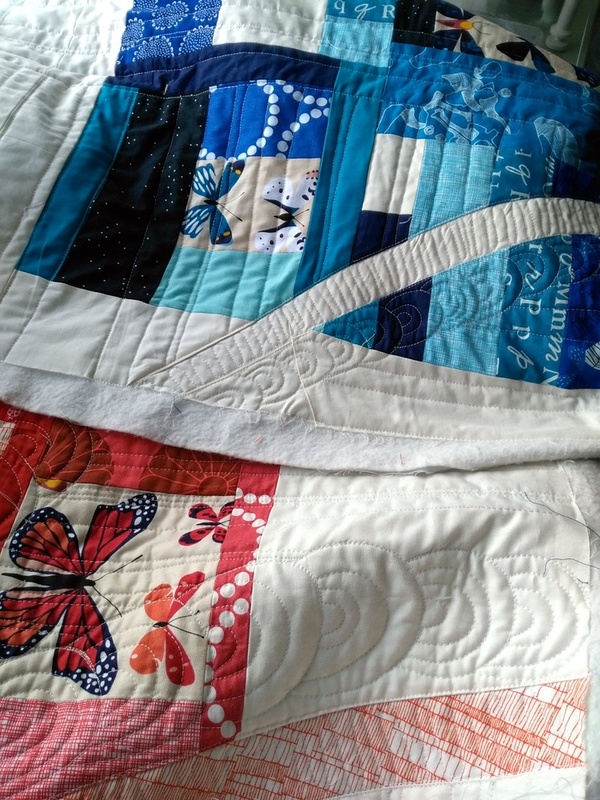 *This is not to imply that the queen of FMQ encourages poor workmanship, but it's important to note that she quilts on a longarm and teaches both home/domestic machine and longarm. As you'll see below, quilting on a longarm can be very different from a domestic. Free motion quilting typically involves setting your machine's stitch length to 0, which allows you full control. If you free motion quilt with a domestic machine, you likely do not have a stitch regulator. The stitch regulator guarantees even stitches, no matter how hard you press the pedal. This is one of the advantages to having a long arm quilting machine - many, if not all of them, have stitch regulators. Bernina also manufactures the BSR (Bernina Stitch Regulator) for their domestic machines. I do not have a stitch regulator on my machine (a Janome Memory Craft 6300), and only this year have I focused on keeping my stitches consistent for all projects (for commissions and Quilt Market quilts, I quilt slower, thus my stitch length is more consistent if not perfect). My quilting is well-practiced and looks great from far away, but perhaps the "quilt police" might look at some of my work and proclaim it "poor workmanship." I've greatly improved with my stitch length over the last 4 years of quilting almost every day (and usually, my intention wasn't to improve stitch length but to improve quilting a certain motif). The question remains: as long as there's adequate tension (stitch tightness), does it actually matter if your stitches are consistent? Yes, if you are entering a quilt show and hope to win something. One of the four constructive comments I received on my QuiltCon quilt, Home, was something to the effect of "work on consistent stitch length." But... what if it's intentional? I have a good reason for keeping the organic lines on my latest project (pictured throughout this post) inconsistent, even within each line (larger stitches becomes smaller and larger again). Does that artistic purpose mean I'm creating more of an art quilt? Personally, the categorization doesn't matter much to me, but I am entering it into QuiltCon this year. It's all interesting food for thought. There's a grand story behind this purposeful mish-mash of stitch lengths and I'll be telling it next week. See you then. So, what do you think? 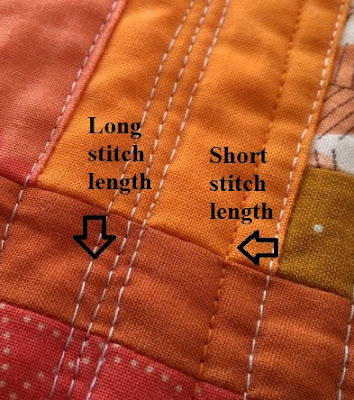 Does stitch length matter in domestic machine quilting? Does it only matter on professional and show quilts? Does it depend on the quilter? Have you ever purposefully varied up your stitch length for a project? Inquiring minds would love to know. I FMQ on my 1960s Husquavarna with a generic hopping foot. My stitch length is ALWAYS set at 4 (the longest length) and my feed dogs are always up. I'm happy with the results I get and the prizes I've won. Well, I was concerned about my ability to do accurate stitch length when I bought my "new" Bernina in 2013, so I was eager to use their Stitch Regulator. My particular machine is a bit of a lemon and works best without the use of the stitch regulator and while my stitch length isn't perfect when I free motion quilt with it... it's better than if I use the regulator, LOL! I guess that experience taught me that it's best to just keep growing my own skills and that consistency and stitch length and all that other stuff will follow. But I'm not huge on being the quilt police and love the "finished is better than perfect" mantra (to a point - I will go back and fix things if I know I have the skill to do better). I have a BSR on my Bernina and I still don't get a consistent stitch length when I use it. Consistent stitch length is important but I don't think it is anything to get tied into knots over, I think the overall look of the quilting is more important really. I have closely scrutinised a few Best in Show quilts (Australia) and there is still inconsistent stitch length somewhere on all of them. I think there is a place for intentional variation in stitch length, I think it would add great texture to a quilt. The only time to worry about it is if the quilt is going to be judged. This is such a good discussion topic! Stitch length and quilting speed is something that I have struggled with somewhat as a self-taught free motion quilter. I would only consider one of my quilts (that is not finished!) 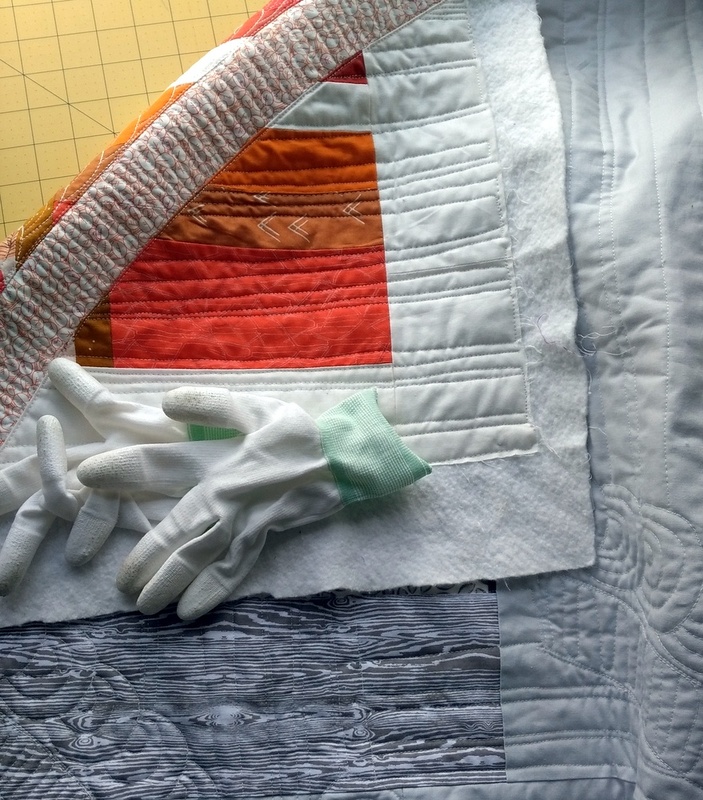 as something nearing show quality since most of my quilts are for FUNction (fun + function). I would rather have perfect tension throughout a quilt than perfect stitch length! I haven't been quilting long and, quite honestly, stitch length is the least of my worries! I use a Bernina with BSR, and as long as the speed remains constant the stitch length does too. However, there's one exception: when I go over a particularly bulky spot, the needle seems to be marking time, marching on the spot, and the stitches are minuscule. Both problems would probably be eliminated with more practice at avoiding bulky spots and maintaining an even speed! Thank you for starting up this discussion; I found the other responses interesting and useful, even though I have no intention of entering my quilts in a show. I handquilting so my quilting has many different stitch lengths. This is a very interesting topic. I agree with everything you stated, Jess. I like things to be perfect for the effort, no matter what that is. Everything you make is pretty cool. Judges are just judges. There "ain't" no special place in Heaven for them either. I tend to agree with Cheryl---the only "problem" with long stitch length is if it is long enough to get snagged on something. I personally have intentionally varied stitch lengths for some projects, usually when including both machine and hand quilting. I think it adds an aesthetic interest, and yet another detailed aspect of the quilt as a whole. But honestly, without a stitch regulator, I find it extremely difficult to have a consistent stitch length while FMQ-ing (yes, I know I need to practice more). 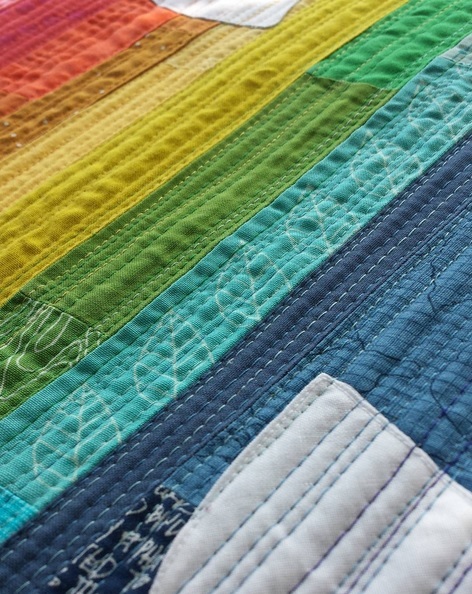 Perhaps this is why people are gravitating toward straight line quilting so much these days? 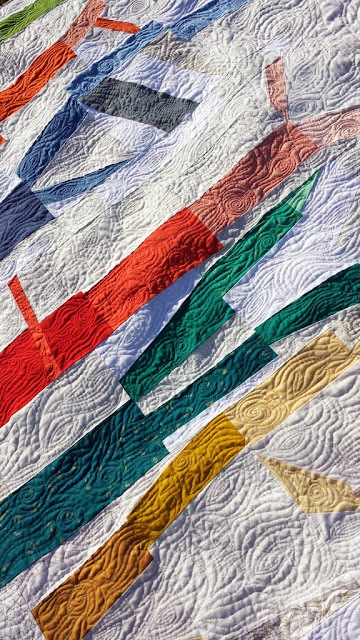 LOL I love the aesthetic of straight line quilting, but I love the invigoration and creative spirit of FMQ. I'm looking forward to see what you have coming, and will keep this in mind for when I ever manage to finish a quilt-show worthy quilt in time to submit it! I think the quilt police can be harsh on this. I have quilted for over 20 years and I am not a "professional". I don't quilt every day and not all my stitches are even - hand or machine. If it doesn't affect the look of the quilt negatively, or you can't get your big toe caught on it, it probably is just fine. oh man I'm so far behind on blogs that I have 10 unread that you've posted. This has never happened in the history of ever. But about stitch lengths--I do strive for consistant stitch length, usually around a 3, but without a stitch regulator there will ALWAYS be a variation, and in any given quilt you could easily find stitches between a 1-4 in length. If I get crazy big stitches I am likely to rip and redo, but that is a personal preference.